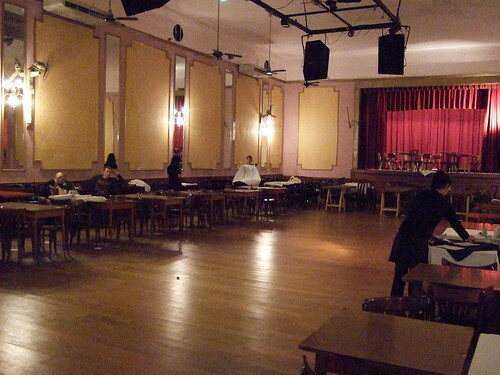 Niño Bien has always been one of my favorite milongas, and when I found the picture I used for illustration of my post on organizing a milonga, I was reminded that, unlike the photographer, I have never been there early, before the milonga really starts. For some reason, we always arrive late..
…and possibly stay late. Although not often so late as to hear the dj put on La Cumparsita, the tango often used to round off the night at Buenos Aires milongas. At Niño Bien, Mario Orlando was playing and like he usually does, played energetic tangos towards the end of the night, to squeeze out the last drop of the guests before they head home. On came a cumparsita so powerful and energetic I had never heard before. While the waiters were cleaning the tables, new waves of energy were bursting over the dance floor, the different instruments taking turns in leading on the next heave. What a night! What an ending! What a cumparsita! On our way out, we stopped by to ask Mario which orchestra he played last. It was Donato Racciatti. Guess who went right to Zival’s the next day? It will never be the same as this first time though.